Recently I was following along with Tim Holtz’s online class Creative Chemistry. 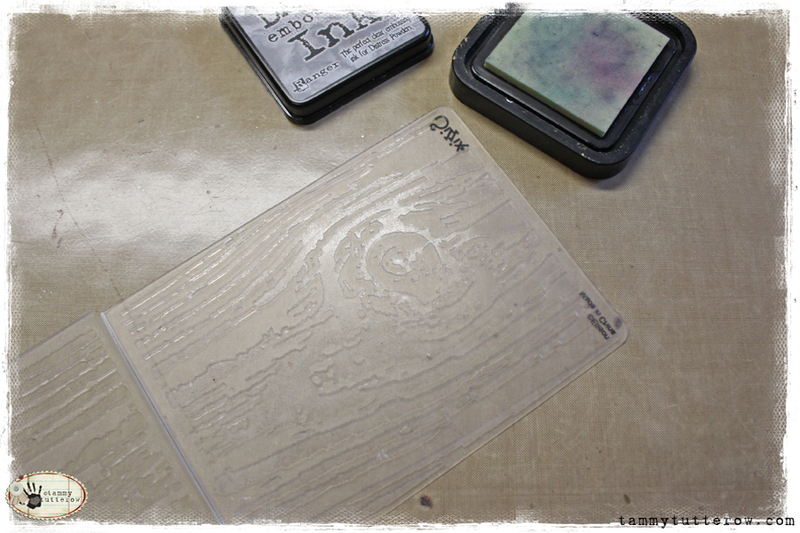 He was sharing how to stamp on embossing folders to create a de-bossed stamped image. I started wondering how it would look if I used the same idea to combine embossing ink with an embossing folder. I felt like the effect would be most noticeable if I used a folder with larger open areas in the design, so I Woodgrain pattern from the Bricked and Woodgrain Texture Fades set. 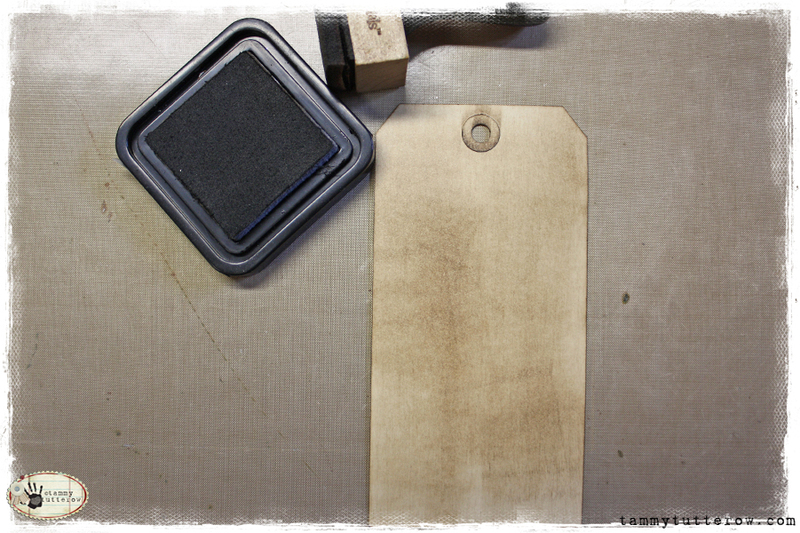 I began by inking a tag with Brushed Corduroy Distress Ink using an ink blending tool. I applied the ink in vertical swipes so that if any brush strokes were to show through, the would be somewhat consistent with the folder design. Dry the ink on your tag with a heat tool. I applied Tim Holtz Distress Embossing Ink to the folder on the inside of the front flap (the side with the Sizzix logo) by laying the folder open flat and tapping the ink pad onto the raised design. Embossing ink pads generally have a foam pad making them very soft. Make sure to tap lightly as you apply the ink to the folder. Pressing hard will cause the ink to get into the depressed sections which will make your entire finished design completely inked. I placed my tag inside the embossing folder. (I have cut my tag in the fold so that I can put tags inside them in either direction.) I placed the tag and folder inside my plates and ran it through my machine. When embossed, the embossing ink will be in the recessed de-bossed areas. I sprinkled clear embossing powder on the tag letting it adhere to the de-bossed areas that had embossing ink on them. If any powder adheres to the raised flat surfaces, simply brush it away with a dry paint brush or your finger. I like a bit of stay powder so I left some on the raised areas so that I would have some ransom speckled areas after inking. Heat the tag to melt the embossing powder. Clean the remaining ink off of your folder using a baby wipe or wet cloth. Ink over the tag with a darker ink color. I used Walnut Stain Distress Ink. The melted clear embossing powder will resist the ink and keep the de-bossed areas from taking on any more ink. 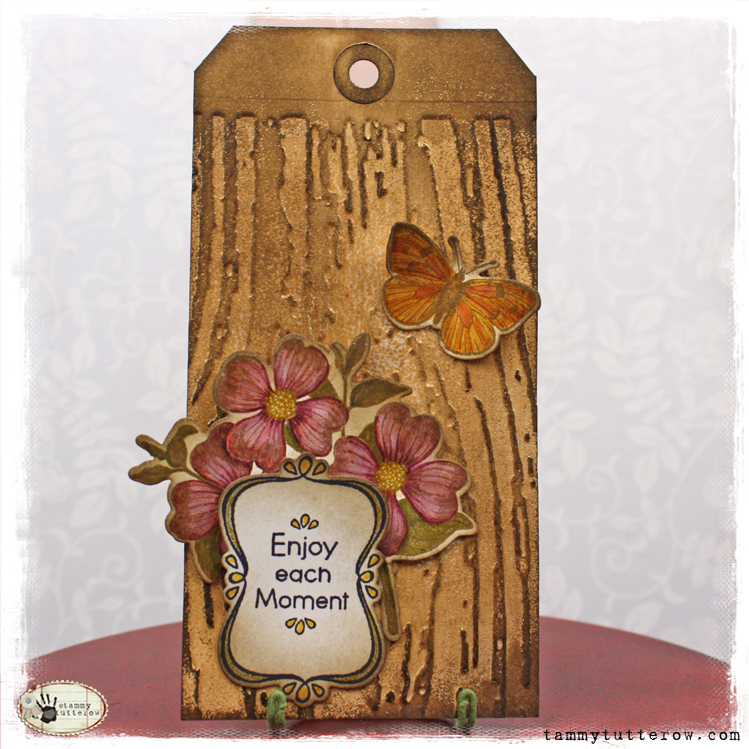 To finish my tag, I stamped a cluster of flowers, a butterfly, and sentiment using the Butterflies #3 and Message Frames Framelits and Stamps sets by Hero Arts and Sizzix. 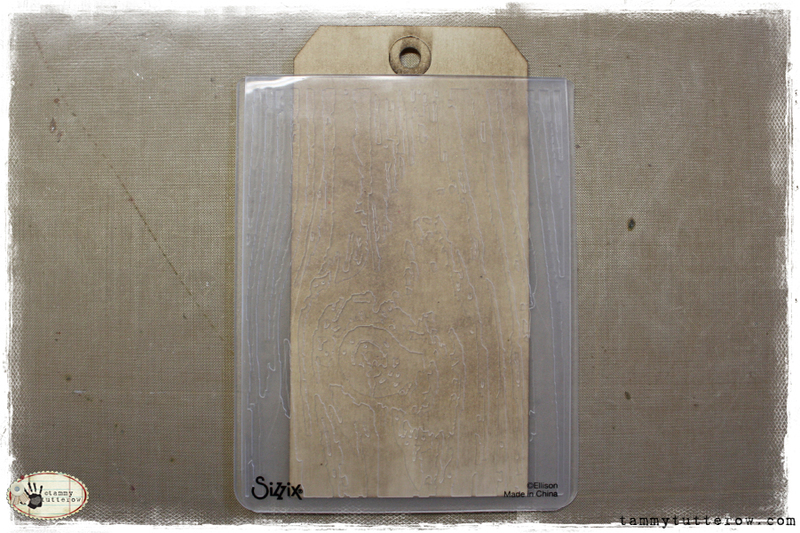 I stamped the images on Bazzill Basics Ivory Simply Smooth cardstock. Stamped the flowers and butterfly with Ranger Coffee Archival Ink. I stamped the frame with Ranger Jet Black Archival Ink. I colored the stamped images with assorted Colors of Tim Holtz Distress Ink Markers. After coloring the images, I added Walnut Stain Distress Ink the edges to give them an aged look. I wanted to adhere my stamped pieces so that they would be very dimensional and look like they were lifting off of the surface. I did this by adhering SuperTape to the lower edges of the flowers and frame and to the center of the butterfly. I used adhesive foam squares to the top edges of the flowers and frame and to the tips of the butterfly’s wings. I adhered the flowers first to the lower section of the tag. I adhered the frame so that it overlapped the flowers. Finally, I added the butterfly to the upper right area of the tag. I really like the finished effect with the embossing powder being in the de-bossed areas. Not only does it mask off the original color, but it adds texture and shine to the finished project. On my tag you can see some slight speckling from stray powder on some of the raised areas. I like the random speckles and didn’t brush them away before melting. If you don’t care for them, take a moment before heating to be sure and brush them away. I love the effect of lifting only part of the finished design. I think it adds a nice effect to the finished look, dimensional without floating. this debossing technique is one of my favorite techniques ! I not only use the embossing folders for this technique but also the stencils of the crafters workshop. Your tag is very “simple”, but shows the technique very well. I don’t have this embossing folder but seeing the result with the flowers on top shows what great folder this is. I think I’ll have to shop fir this one;.. This is so cool and the final tag is wonderful – WOW! Thank you so much! beautiful tag. love this technique and the colors are gorgeous! Beautiful tag Tammy and what an awesome idea! Looking forward to trying this technique myself. Thank you for sharing.